Index Price: Commission Piece. POA for similar piece. Once these factors have been established, the only limit is the combined imaginations of the commissioner and the goldsmith. The commissioner loved the Silver & Green Crystal earrings (see earlier) but she didn't wear silver. 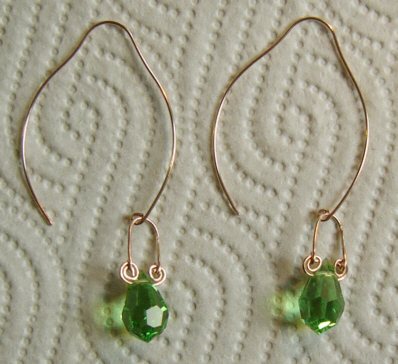 Could I make them in Rose Gold to match the Victorian pieces of family jewels? The closest color to Victorian Rose Gold is modern Red Gold, both of which have copper as the alloying metal, which gives the reddish tone to the gold. The 50mm long loops are hand-forged from 14K Red Gold, and the green drops are commercially manufactured crystal glass. (The green is actually a bright peridot-green.) N.B. Although they look a bit lemon-shaped when off, once in the ear the earwires appear to be 'hoops'.